Can Drinking Water Fountains Be Safe at School? As most of you know, the news has recently been set alight by the story of a nine-year-old boy who was granted – and then lost – a pay-out of £3 215 after cutting himself on a drinking water fountain when his seven-year-old brother moved out of the way of his fist. While the internet is alive with views and opinions on what this should mean for drinking fountains in schools, we have decided to take the time to compile a response that we hope will double as a helpful aid for schools who may be worried about what the future holds. Access to fresh drinking water for pupils in schools is important, making drinking water fountains important. Besides the myriad of health benefits that regularly drinking water has on the human body, it’s an innate human right to be able to sip on clean water whenever the thirst or need to do so may arise. Whilst a drinking water fountain may have been a contributing factor to the injury to the nine-year-old’s hand, it cannot solely take the blame. More correctly, the injury resulted from a spot of playground rough and tumble, during which kids will be kids and accidents – or injuries – will happen. We at Drinking Water Fountains will never fail to emphasize the importance of clean drinking water for pupils, and pride ourselves in having been instrumental in providing water fountains to several schools around the country. 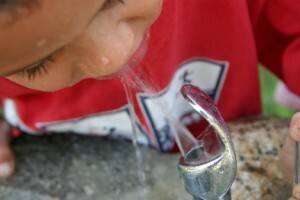 While we cannot guarantee that children will maintain a behavior that will see them not injure themselves on water fountains or any other objects (such as the actual buildings of the school or even the ground upon which we all walk), we can work with the schools to recommend a drinking water fountain that will fulfill the students’ drinking water needs, while maximizing the safety of those who use the fountains. We’ve included some information on some of our indoor and outdoor drinking water fountains that we hope you will find helpful when you’re next trying to decide on what fountain the school you run, or the one you send your kids to, might need. Bottle filling recessed drinking fountains can be fitted with button operated swan-neck taps that allow for the pupils to easily fill their water bottles. Chilled water recessed fountains incorporate water chilling facilities, to provide the pupils with chilled water for summer days, when water intake is important. External Usage – these recessed drinking water fountains can be used on the outside of buildings because they have no external parts, protecting them from the elements year-round. Another alternative to the recessed drinking water fountains are the wall-mounted fountains. These fountains can also be altered into bottle filling fountains, and can be added by integrating a water filter inline inside the drinking fountain, while capable of being installed at a variety of different heights making them suitable for schools from primary level and up. Our range of outdoor drinking water fountains can be located wherever the schools are capable of bringing mains-fed water. Often in the form of floor-standing fountains, these are commonplace in school playgrounds and sport facilities. Capable of being made from bronze, statuary bronze, stainless steel or polymer aggregate, the outdoor drinking water fountains stand up to inclement weather conditions and can come in different heights, making them suitable for primary schools and every level there above. Drinking Water Fountains is more than happy to answer any enquiries that schools or parents of pupils may have, and we hope to work together with schools to ensure there remains a safe and fresh supply of water from drinking fountains in every school in the country.